Our TOMY mission is to make the world smile. We offer a wide range of innovative, high-quality toys and nursery products that kids love and parents ask for by name. We never take for granted the role our products play in the lives of children and families. We want to earn your trust and loyalty by manufacturing high quality products that deliver safety, value, and a little TOMY magic. What can we do to make you smile? Tomy Toys makes learning while you play fun. All toys occupy little hands while improving manual dexterity, helping kids' concentration and memory through play with these bright and funky toys. The most enchanting cot projector/lightshow. 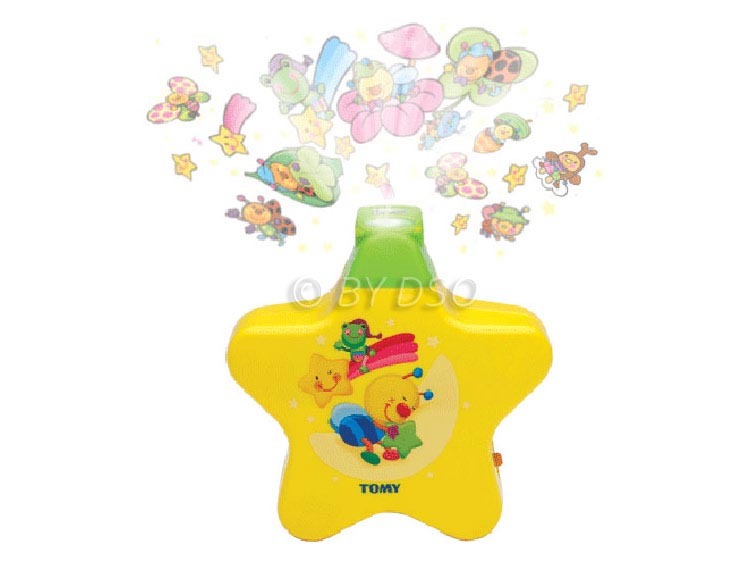 Even the youngest of babies have active minds as they lie in their cot, and the Starlight Dreamshow from Tomy is designed to occupy those little minds, then relax them and lull them to sleep. Consisting of a small, plastic moulded star, measuring roughly 14cm (5.5 inches) from tip to tip, and 6cm (2.5 inches) in depth, the Starlight Dreamshow has several operational modes controllable using a switch. Move the switch from 'off' to either the '5 min' or '10 min' setting, then choose between pictures only or pictures and music. On the latter setting, the Starlight Dreamshow will project small, pastel images of teddies, stars, moons and clouds onto the ceiling, while playing through three soft and gentle lullabies. On the first setting, the pictures are shown in silence. If your baby isnt asleep by the time the Starlight Dreamshow automatically switches off, just press the on button again for a replay. The Starlight Dreamshow can also be switched off early, during either of the timed programmes. Suitable from birth, the Starlight Dreamshow requires 4 x AA batteries, which are not included. A handy plastic strap comes with the unit, which can be fitted to the unit to fix it to the side of a cot, or removed so the projector can be freestanding on a chest of drawers or bedside cabinet. The image of a teddy bear on a cloud pictured on the front of the Starlight Dreamshow finishes off the beautiful effect and makes this a lovely addition to any nursery. Starlight Dreamshow plays 3 soothing lullabies to gently send your baby to sleep. Attaches to the cot or free-standing.